Today’s contribution comes from James Johnson, an ex-broke shoe salesman turned side-hustler, who later became a full-time freelance writer in part due to the cool tactic he shares below. As they tend to do, James’ writing side hustle begat a new project: Freelance Writers School, where he teaches aspiring freelance writers how to get started and take their business to the $1000 a month level and beyond. What if I told you there was an easy way to access the hidden freelance job market? 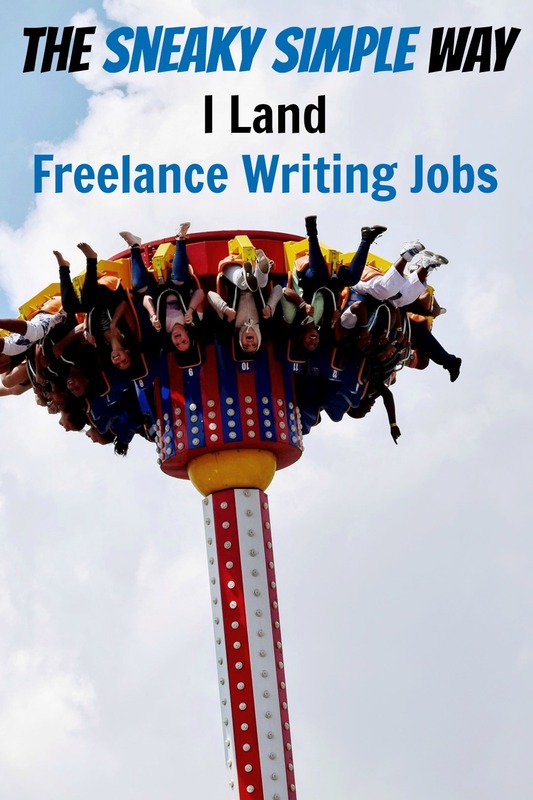 That with just a few minutes work you could unlock a world of high paying, unadvertised freelance writing jobs, that are looking to hire people like you. You’d probably say I was crazy. But the truth is that such a system exists, and it’s been a key part of my own business for the last two years. In 2015, after months of endless rejections, cold leads and being ignored, I decided to flip my business model and change how I found clients. In this article I’d like to introduce you to the Upside Down method of finding clients and show you how it can transform your business. What the Upside Down method is and why it works. How to curate a hidden market job board. How to find relevant and lucrative clients in your niche. 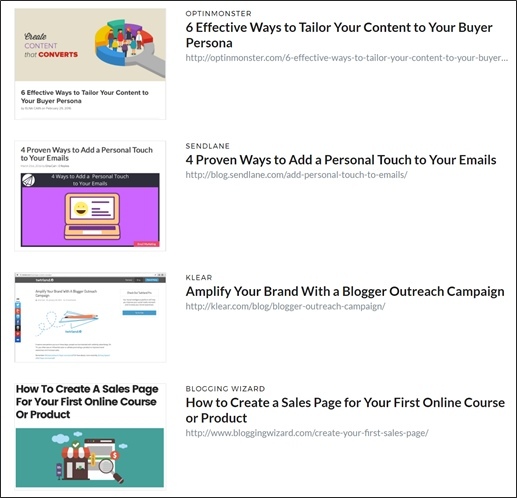 How to write a pitch that stands out in an inbox. 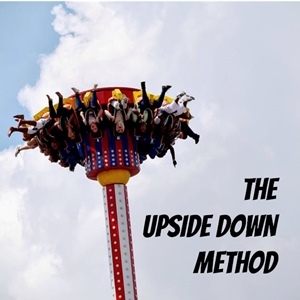 The Upside Down method takes the traditional system of finding freelance clients and flips it, well…upside down. (I never said branding was my strong suit). Instead of looking for businesses and clients in your niche to pitch to, you’re going to look for other freelancers. More specifically, their portfolios. Once you find them you can then pitch to the clients that they have worked for — or their competitors — and narrow down your search. …you’ve just struck gold. You’ve found a list of companies that are willing to pay freelance writers to work for them. This means you can narrow down your search for paying clients in just a few minutes. Nick’s Notes: The articles I’ve done for Lifehack and Good Men Project were unpaid. You know these companies are already open to working with freelancers and will be warmer to your pitches than sending a cold pitch. Competitors will likely have similar strategies and want good writers to remain competitive. This was a $1500+ per month contract for less than 15 hours a month. All because of one link I’d found in another freelance writer’s portfolio. That’s more than enough to power your side hustle, isn’t it? This method wasn’t a one-hit wonder either. I’ve used it to land clients in all sorts of niches — from online invoicing to social media — and pick up the most lucrative contracts of my career. Before I give you the step-by-step instructions, I want to address the large, pink, fluffy elephant in the room. Poaching. This method isn’t designed for you to steal clients from other writers, designers, artists, or hustlers. Instead it’s for finding warm clients who have experience hiring, and paying, freelancers. In the whole time I’ve been using this technique to find clients I’ve never taken a client from another writer. I’ve simply been added to the team, or replaced that writer when they’ve moved on to other projects. This system will help you find and win new clients; but it’s not about winning at the expense of other freelancers. That being said, let’s move on to the juicy good stuff, shall we? 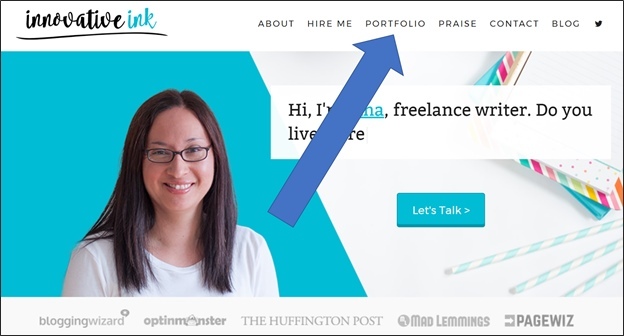 Guest Posts are your access point to freelance writer portfolios. It’s a great business practice for freelancers trying to grow their businesses, gain exposure, and capture potential clients. (You should really implement it yourself if you’re not already). 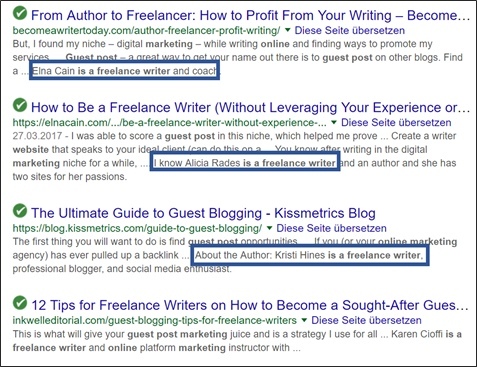 What we’re trying to do here is get Google to highlight Freelance Writers who have guest posted in this niche. What I’d usually do is open each of these results in a new tab. That means you can work through one cycle and then go onto the next, and the next and so on. But for this article I’m going to choose the first result, Elna. If I select her article and scroll down to the bottom you can see her bio box containing two links. The first one to a mommy blog that she runs and one to a freelance writing site. It takes us to her wonderful looking site (it makes my portfolio site look like someone’s child has drawn it in crayon). And most importantly she has a portfolio page, exactly what we’re looking for. Elna is clearly a great writer and has a brilliant portfolio. And she’s worked with a lot of companies I’ve never even heard of. Which is a positive sign, because it means I haven’t pitched to them yet. Once you’ve found a post that fits you can just head on over to their site. (Even if it doesn’t seem like a perfect fit you can check it out for a better idea). You’ve found a guest post. You’ve found a portfolio. 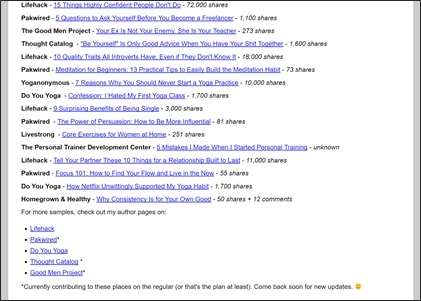 You’ve found a post or idea that fits your style and niche. Now, it’s time to go in for the pitch. 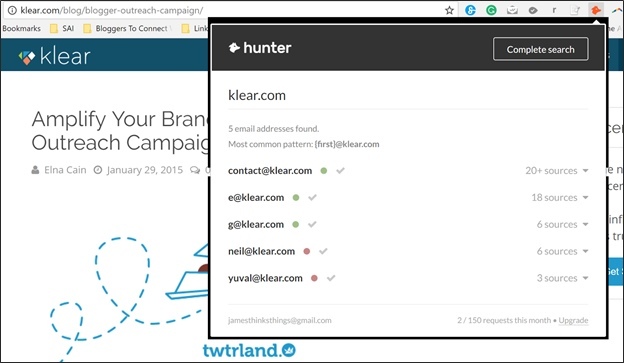 If you’re not familiar with the last point, Hunter is a browser extension that enables you to find the emails of people who own the site. What I’ve found really useful for increasing response rate is to mention the writer who you found their work through. I feel it adds a level of trust to it, even if there really isn’t any. And it works even better if you’ve been featured on another site with the author in the past. My name is [NAME] and I’m a freelance writer from [PLACE]. I was wondering if you had any spaces for extra writers on the [COMPANY NAME] blog? I found your site through [WRITERS NAME] and I’m a huge fan of the work you’re doing. It’s something I’d love to be a part of and also feel I could bring a lot of value to the table. Thanks for your time, and I look forward to hearing back from you. Just take all of the deletable sections and add your own information where it’s relevant! This is one of the most simple freelance writing tutorials you’ll ever read. But it’s also one of the most effective. I’m confident if you follow the steps as they’ve been laid out, using the sample pitch (and add your own flair), you’ll find yourself landing more high paying clients for your side hustle than ever before. And if you have any questions or comments about anything you’ve read let me know in the comments! Thanks James for the awesome tutorial! This is a classic model! I remember reading about this years ago in ‘The Little Black Book of Sales’. I like the thinking behind this project and see it as a great addition for freelancers who have settled themselves into the freelancing business. Personally I’d make sure I had my proposal and pitching skills down before doing this. Great re-post of some classic ideas and even better application of new technology to the system! Checking out your site to! I had no idea it was already a proven technique, I came across it intuitively! Guess there really are no new ideas eh? It’s definitely better to be comfortable pitching, but you don’t need to be perfect. As I showed in the article, even my relatively weak pitch (at least at the time), landed me a good contract. That’s the beauty of hitting up warm prospects. Hopefully see you over on the site too! I ventured into freelance writing this year and I absolutely love it. I have been wanting to revamp sourcing clients and this is such a great technique. Thanks Nick for allowing James to share this with us ! Thanks so much for reading and reaching out! What’s your biggest barrier to getting clients right now, what’s made you want to revamp? Well done sir! Thanks for sharing – I will definitely implement this one! Also don’t forget to check out my site over ar Freelance Writers School where I share more content like this to the mailing list! Very clever, Nick. Sort of a reverse engineering approach to finding freelance work. I’ve done something similar to find locum tenens jobs as a physician, which is essentially freelance doctoring. The value of this post is bringing a long-used (well, mostly since the invention of the WWW) marketing technique to entrepreneurs who don’t have a background in marketing. In my experience, there are a LOT of these entrepreneurs: great idea with no business or marketing knowledge/skills. The side hustle is the ideal way to make money full-time today. With daytime employment being in complete uncertainty, one must look for alternative ways to earn a healthy salary. And working online is the ultimate side hustle for people who are serious about turning side hustles into million dollar online businesses. This is an excellent strategy to find companies who are warm in this space, thanks so much for sharing!! !